Potatoes originated in Peru 7-10,000 years ago and gradually spread through the Americas. They were introduced to Europe in the second half of the 16th Century by the Spanish. The potato was slow to be adopted by distrustful European farmers, but soon enough it became an important food staple and field crop that played a major role in the European 19th century population boom as it was easy to grow and easy to store. However, lack of genetic diversity, due to the very limited number of varieties initially introduced, left the crop vulnerable to disease. In 1845 late blight spread rapidly through the poorer communities of western Ireland, resulting in the crop failures that led to the Great Irish Famine during which a million people died and a million more emigrated. Chitting is the process of placing seed potatoes in a cool, light place to encourage strong sturdy shoots to grow before they are planted in the ground. 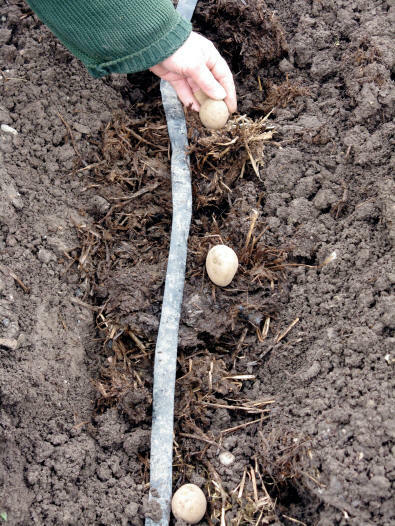 Start chitting from late January about six weeks before you intend to plant out the potatoes. If you want to grow very early varieties, such as Maris Bard, and to harvest them as early as possible, then chitting is essential. 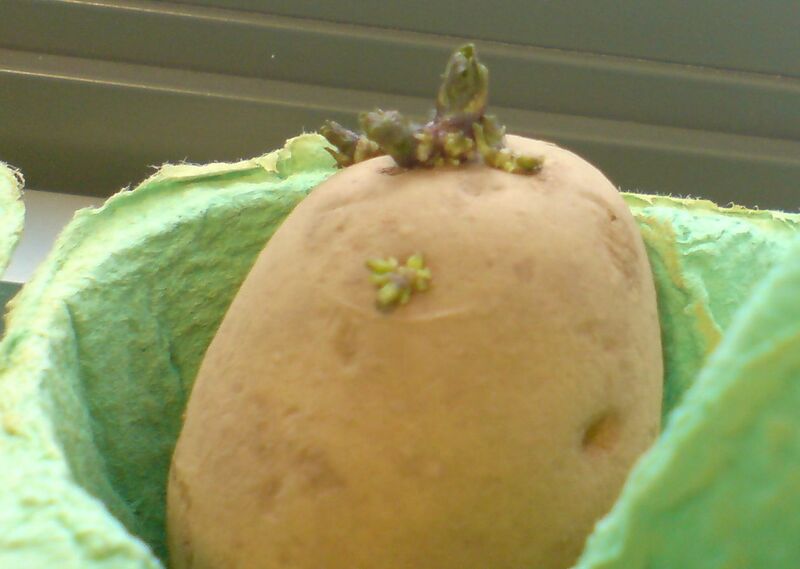 All potatoes will start to sprout at this time of year and if they are not offered the right cool, light conditions they may develop elongated and white shoots (or chits). Stand the tubers with the more rounded, blunt end uppermost in trays or old egg boxes, with plenty of natural light (but cool – not in a heated room). You should leave all the sprouts on seed potatoes. The aim is to have a small number of sturdy shoots, not masses of elongated sprouts, which dissipate the energy of the seed potato. If you rub sprouts off, then you’ll get a smaller crop but larger potatoes. Commercial growers never bother to chit their potatoes and it seems to make little difference to the yield. However, they are able to keep their seed potatoes dormant by providing very exact storage conditions and this is very hard for the home gardener to do. For this reason, most amateur gardeners do chit their seed potatoes but any you have bought late can go straight in the ground, unchitted, at around Easter time. Traditionally Easter weekend is potato planting weekend (though of course Easter varies each year!). Or if you plant them in a container inside your greenhouse you could plant in January for some really early crops. Some people sow a late crop to get new potatoes for Christmas day. Potatoes will grow in any ground that isn’t waterlogged. A sunny spot will encourage the leaves or ‘shaws’ to stay dry and therefore be less prone to attacks from blight. Potatoes are very greedy feeders, so the richer the soil the better. Potatoes prefer acid soil, so at least a year (if not two) after liming is best. Dig a trench about one spade’s depth and width, putting the soil to one side. Spread compost along the trench – it doesn’t need to be as fine as you’d normally use. Well rotted muck is also ideal as the potatoes are very greedy but not too discriminating. Wilted comfrey leaves are great too. With 1st Earlies, leave all the growing shoots on the seed potato, but remove all but 3 shoots on 2nd Earlies and Maincrop to ensure larger tubers. Plant ‘earlies’ about 30cm / 12in apart from each other, in rows which are 60cm / 2ft apart. Plant maincrop potatoes about 35cm / 15in apart, in rows which are 75cm / 2ft 6in apart. Where you are planting more than one row, the rows should (ideally) run from North to South to allow each plant its full share of sun. Handle your chitted tubers with care, gently setting them into the trench with the shoots pointing upwards, being careful not to break the shoots. Hand fill the trench over the potatoes trying to avoid damaging any sprouts. Cover the potatoes lightly with soil. Scatter bonemeal or similar long lasting fertiliser over the top soil and rake it in. As soon as the shoots appear, earth up each plant by covering it with a ridge of soil so that the shoots are just buried. You need to do this at regular intervals and by the end of the season each plant will have a small mound around it about 15cm (6in) high. Varieties – What’s the difference between Waxy and Floury Potatoes? Waxy potatoes are translucent and feel moist and pasty. They are good at staying firm and keeping their shape so make great salad potatoes. Floury potatoes are brighter and more granular in appearance with a drier feel. They’re better for dishes where you want fluffy potatoes or for mash. 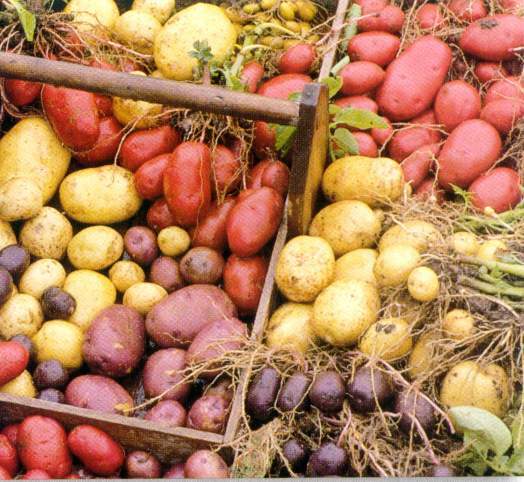 Lots more about Potato varieties on the Love Potatoes Site from the British Potato Council. According to Wikipedia there are over 1000 types of potato! Contrary to popular belief, potatoes aren’t high in calories (its the oil, butter and cheese that they are cooked in or prepared with that’s the problem! ), they’re naturally fat-free, bursting with vitamins and minerals, contain absolutely no cholesterol and when served with their skins are a great source of fibre. Every way of cooking potatoes can be done with their skins on (not just Jacket spuds). We eat skin-on chips, saute, boiled, roast and even mash! Just scrub them well and cut off any damaged skin. The Potato cyst eelworm is a nasty one – we have a whole separate page on this. And then of course there is Blight…. There are two types of Blight – Phytophthora infestans causes the serious potato disease known as late blight or potato blight. The spores of this oomycete (its not a fungus apparently!) over-winter on infected tubers, particularly those that are left in the ground after the previous year’s harvest, in cull piles, soil or infected volunteer plants and are spread rapidly in warm and wet conditions. This can have devastating effects by destroying entire crops. Spores develop on the leaves, spreading through the crop when temperatures are above 10 °C (50 °F) and humidity is over 75%-80% for 2 days or more. Rain can wash spores into the soil where they infect young tubers. Spores can also travel long distances on the wind – which means if one field gets it – they all do. Control of tomato blight prevention begins by destroying infected plants and potato tubers. Do not leave infected tubers in the compost pile. Quickly bag, and burn or throw them out in the trash to prevent spores from spreading to other tomato or potato plants. Early Blight , caused by the fungal pathogen Alternaria solani, is confusingly also often called “potato blight”. This organism can also infect tomatoes and some other members of the Solanaceae family.This disease can be prevented with some fungicides, but other preventative measures include ensuring the healthy circulation of air in garden rows, rotating crops so that solanaceous plants (potatoes and tomatoes) are only present every three years, and choosing resistant cultivars.